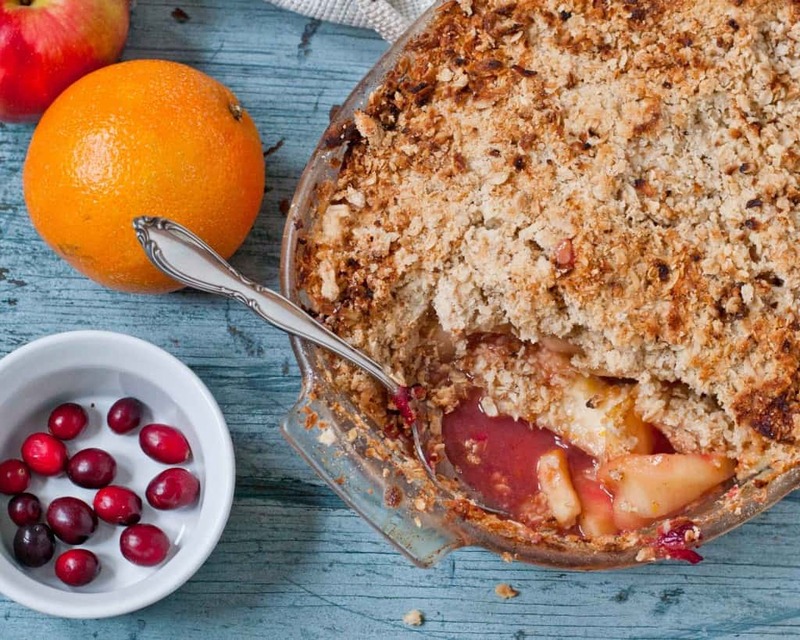 This Spiced Apple Cranberry Crisp is warm and cozy. A comforting dessert for a cold winter night. Well, y’all, the new year is almost upon us. It’s a time of year reserved for reflecting, taking stock of our lives, and looking forward to the future, which is exactly what we’re doing this week for #SundaySupper. I’ve never been very good at resolutions. Well actually, I take that back. I’m pretty great at making resolutions, I’m just terrible at keeping them. Like most people I’ve often made lists of things I want to do better in the new year. Mine were always pretty standard–Eat healthy! Exercise more! Keep the house clean! Volunteer more! I had great intentions, but they usually only lasted about 2 weeks before slipping from my conscious. Over the years, I’ve found my resolutions only made me feel guilty when I discovered them sometime mid-February crumpled up in the back of the still-unorganized junk drawer. So this year, I’ve decided not to challenge myself to do more or be better. For me, these self-imposed commands just aren’t motivating. Instead, I’m challenging myself to embrace the imperfect. I’m challenging myself to be gracious–with myself and with others. I’m challenging myself to live in the moment and love it for what it is, not what I think it should be. And that applies to so many areas of my life–from loving my body even if it has more soft spots than I’d like to loving my blog even when the stats say it’s not doing as well as I think it should be. If the past few months of craziness have taught me anything, it’s that grace and beauty and laughter can still be found in the midst of life’s hardest and messiest moments. And instead of wishing away those moments, I want to choose to accept them and learn from them. I suppose you could say I’m challenging myself to be content, in whatever stage I find myself. It’s perhaps the hardest “resolution” I’ve ever made, but I like to think of it more as a work in progress. The dawning of a new year is just a dot on the journey. Weeeeell, enough of this shmaltzy schmaltz, let’s talk about the recipe! After all the extravagant food, gift exchanges, and parties are past, I find myself longing for the classics. This Spiced Cranberry Apple Crisp is comforting and familiar, like settling in for coffee with an old friend. In fact, the recipe for the crisp comes from an old college friend of mine, the lovely Melanie of Adorkable Recipes. This apple crisp is indeed a classic. The spices are warm and comforting, and it has just the right amount of buttery oatmeal crumb topping. I added the cranberries to give it some festive color and that pop of tang. This is a dish best served warm with a scoop of ice cream, shared with the ones you love most in the world. Friends, I couldn’t let this year slip away without thanking all of you for making 2013 the most exciting one yet for Neighborfood. I’ve been so excited to see this little space grow. Thank you for reading and cooking and baking right along with me. It’s been so fun to get to know some of you better this year, and I look forward to sharing so much more in 2014! Wishing you and yours a joyful New Year! Preheat the oven to 400 degrees. Grease a 9 x 13 inch pan or other large, deep casserole dish. Peel the apples and cut them into thin slices. In a large bowl, combine the sliced apples, fresh cranberries, brown sugar, flour, cinnamon, nutmeg, cloves, orange zest, juice, and vanilla. Toss until the apples and cranberries are coated. Place the mixture into the prepared pan. Add the oats, flour, brown sugar, and salt to the same mixing bowl, and stir them together until combined. Using a pastry cutter or two forks, cut the butter into the oat mixture until it forms coarse crumbs. 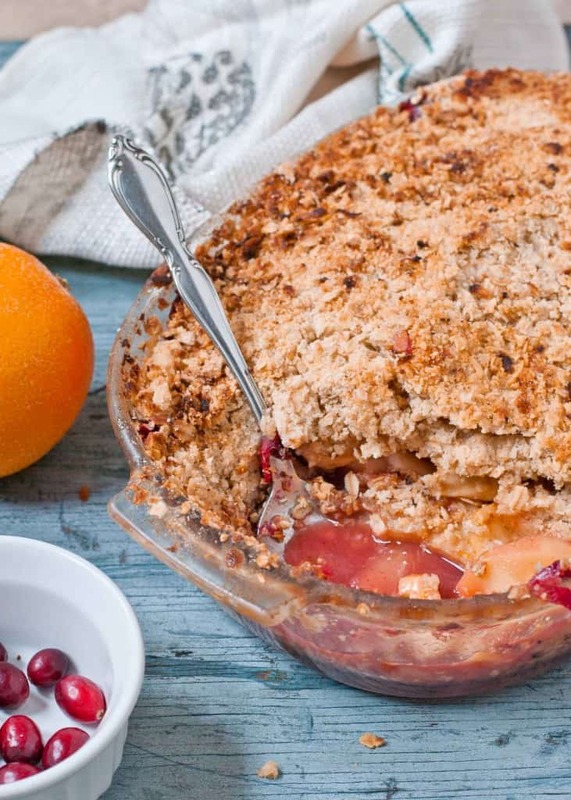 Pour the crumbs over the apple mixture then place the pan in the oven and bake for 45 minutes or until fruit is soft and crumb topping is golden brown. “Grace and beauty and laughter can still be found in the midst of life’s hardest and messiest moments.” Very wise, indeed. I for one love your goals. We do have to be happy where we are. Wanting “more” is great, but if we can’t be happy in our own skin, all the time, how can we really be happy? I love your delicious crisp you have here…even if it isn’t spiked 😉 Happy New Year! I wish you much success with those wonderful challenges you have set for yourself in the coming year. Now pass me a plate of this delicious crisp please!! I so wish I could Renee! Love your resolutions for this year. I think we can all learn from life’s hardest moments. I am so thankful that you are part of our #SundaySupper Family. It has been such a pleasure getting to know you and I hope we have the opportunity to meet IRL in 2014. How great would that be?! I would absolutely love to meet more of the family in person! I love love love crisps! Yours is beautiful and I love the orange with the apples. Yum!! Me too Shannon! They’re one of my favorite desserts! Thanks Liz! I loved the pop of color. I hope you have a wonderful New Year! This sounds like a great combo for a crisp (spiked or not 😉 ! Happy New Year! Haha! Next time it’s definitely getting spiked! I just love crisps, and this looks like a winner! I think you’ve made the toughest resolution of all. It’s hard to accept imperfections. Ugh…you’re telling me! But I’m definitely going to give it my best this year! I think you’ve got the resolution thing down. Making yourself better is a process and it’s a good time to declare it 😉 I hope you have a wonderful new year and best in 2014! That’s the perfect way to describe it. Thanks for coming by! I love your resolutions – they sound perfect! – Wishing you and your family great happiness, health and success in the New Year. I almost forgot your cranberry apple crisp sounds fantastic!!! Thanks Beate…Happy New Year to you too! I want to make this crisp for a little dinner tomorrow! 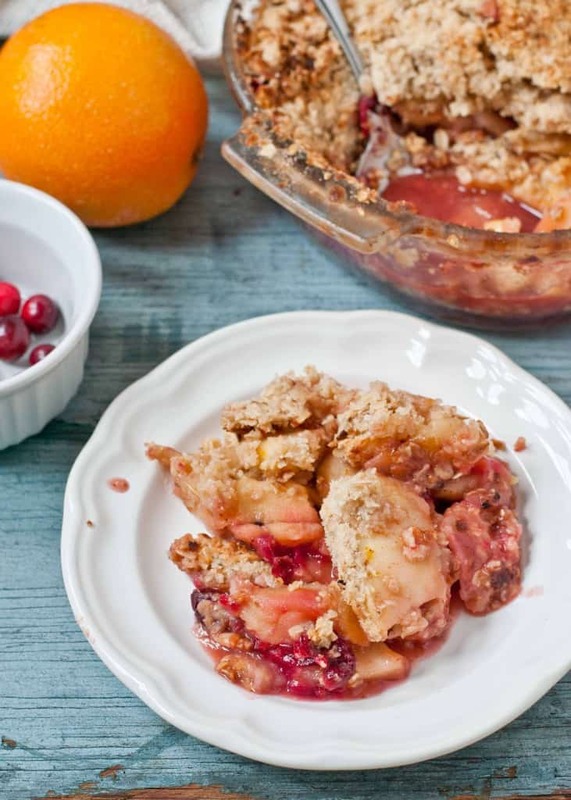 Apple crisps are my favorites, and i love the addition of the cranberries. And I love your approach to resolutions. It’s hard, but that kind of attitude serves us well in so many aspects of our life. Have a wonderful 2014! Let me know how you guys liked it! Have a great New Year! This sounds delicious! And so does your “resolution” for the new year. Sometimes we forget to embrace and appreciate the little things in life as well as the moments that seem the least attractive…It has been wonderful following you through Sunday Supper. Hope you have a happy and healthy new year! Shaina–thanks so much. Can’t wait to connect more in the new year! What a great approach to 2014! And a fabulous recipe to kick it off! Apple Crisp is one of my all time favorites and yours looks so good!!!! Love your outlook for the new year! Happy new Years to you and your family!! You nailed this on the head! We all need to be more gracious with ourselves. Love your thinking! AND THIS CRISP! Thanks Lauren. I hope you have a wonderful New Year! You realize I can’t actually read this title without thinking “spiked” now right? Spiked or unspiked it looks absolutely delicious! Me neither! This thing is totally getting bourbon next time around. Yum! Is there any left? 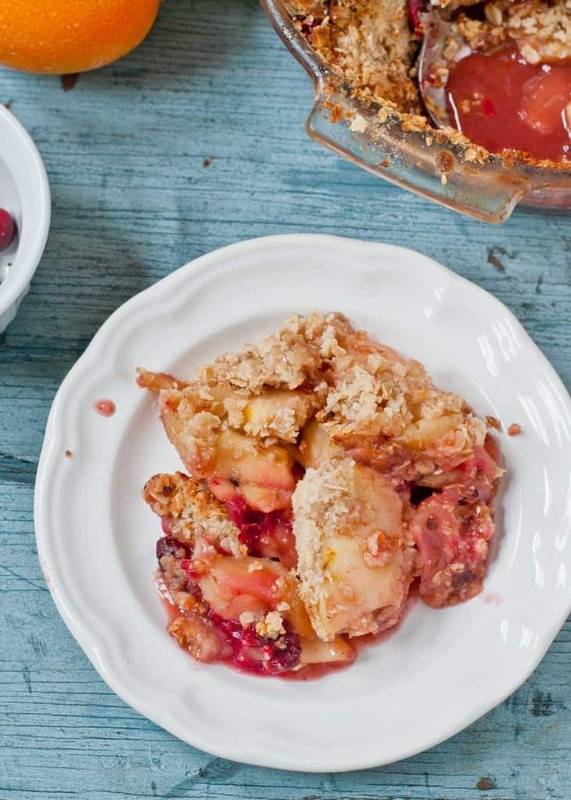 I made an apple cranberry crisp for Thanksgiving a few years ago….your looks (and I bet tastes) way better! Happy New Year! My dad often added cranberries to his famous, in our family :), apple pie. These days Christmas just isn’t the same without it. One of these days I need to make it myself. This crisp looks so good and nice and simple too.